When its time to negotiate your next home purchase or refinance in Albany, NY contact a home loan professional from Artisan Mortgage Company and secure one of the lowest mortgage rates available. 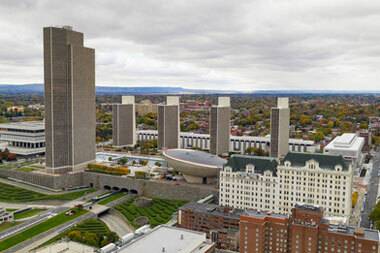 Albany NY, the Capital City of New York offers a variety of housing options, and so Artisan Mortgage offers many loan options to cover them all - from a 30 Year Jumbo Loan for your fabulous condominium in Mansion District, to a FHA Loan for a charming single home in Arbor Hill. With a variety of home loan and refinance programs available in Albany, NY including USDA, VA, first time buyers and 203k home improvement loans across nearby Cohoes, Watervliet, Colonie, Westmere, Menands, Ravena, Voorheesville, Green Island - don't wait to talk to our mortgage brokers about how they can help with your mortgage needs. Dial 1-800-499-0141 to connect with the mortgage specialists at Artisan now, prequalify here, or fill out the fast, simple rate quote form on this page to find out about additional home loan options that you may qualify for. And if you are in the market to buy a home, we offer many attractive mortgages in Albany, NY with low to no down payment options to make your purchase affordable. We offer many types of loans including Conventional, Federal Housing Administration (FHA) www.hud.gov, Veteran Administration (VA), and Rural Housing loans. …and many more! Contact one of our skilled mortgage consultants to learn more. Home buyers and owners have many choices when it comes to loan programs from Artisan. While many consumers opt for the popular 30 year fixed rate mortgage, some may want to consider other programs such as a 3-year adjustable rate loan. A new addition to the family may have you making an addition to your home. Or maybe you want to update your kitchen or master bath. We can help finance your house improvement through a variety of loan types. Purchase home loans are available to you at today's low interest rates. Whether you chose to secure loan pre-approval while you are house shopping or close fast on the home you have already found, we provide great rates and service – FAST! When you're considering an auto loan or mortgage loan, many questions may spring into your mind. What will my monthly payments be? Can I afford the additional costs? Condo Financing ... and more. ARM loans traditionally have a lower beginning interest rate than fixed rate loans, allowing you to purchase more home up-front. Initial ARM interest rates are fixed for a set period of time, then adjust annually. This type might be best for you if you don't want to risk a change in the economy that could result in a substantially higher monthly payment - it features a permanent rate and monthly payment amount. Remember to occasionally review your credit report to ensure the information is correct. There is no effect to your score by requesting your own report. If you find errors, contact the reporting bureau and lender. Mistakes can be made and checking your report is a good protection against identity theft. The other time you’ll hear about escrow is if your mortgage lender handles payment of your property taxes and homeowner’s insurance for you. In most cases, your lender includes the monthly cost of taxes and insurance in your payment. That way, you don’t have to worry about making large tax and insurance payments all at once. Many first time buyers or owners have experienced financial difficulties and bad credit due to personal issues ranging from the loss of a job, divorce or poor investments. Bankruptcy? Foreclosure? Late Payment? Collections? Artisan’s professionals have the expertise to assist borrowers who are burdened with poor credit. We provide a bad credit home loan in Albany, NY that will help you out in this situation. Have you been thinking about remodeling your bathroom? Finishing your basement? Need a new roof? Contact AMC today to learn more about how our home improvement loans can help you. Contact us for more information! Facing college tuition payments? We offer equity loans for all types of residential properties. And with the current tax laws, you may be able to enjoy tax savings since equity line interest may be tax deductible. Be sure to consult your tax advisor. A jumbo loan provides clients with more options for financing larger more expensive properties. This loan is offered with either a fixed or adjustable rate. They come in two basic products. These are a traditional Home Equity second mortgage and a Equity Line of Credit (HELOC). These loans are for those who want tax deductibility and cash availability. Both loan products come in fixed and adjustable terms. In many cases we are able to take all of your debts and roll them into one low monthly mortgage payment. Apply now for your free savings analysis and we will identify the best program for you based on monthly payment savings, increased cash flow, yearly savings projected over time, and possible tax advantages. Most borrowers who have credit problems will pay a higher interest rate. We will pull your report and discuss your problems and possible mortgage solutions with you. Advantages of a repair program are that you could use the fixed rate period to prove your creditworthiness while making affordable and predictable monthly payments. You can also take advantage of lower initial rates. No Documentation Loans do not require employment, income or assets to be stated on your loan application. This solution is ideal for individuals whose income is difficult to verify or if you wish to avoid the complexities of a traditional mortgage documentation. Reasonable credit is required. Talk to our lending experts about your needs and we will work with you to figure out your options. We’ll give you the answers you need quickly and forge a relationship that you can only get from a bank dedicated to customer service. Most of the people experience several shortfalls. To liquidate one debt you may need to take over from someone else, making an additional balance owed. Debt consolidation is the answer to this issue. My wife and I just completed a mortgage deal and are very happy with the service. We have done several of these things in the past and not once was the service as great as this. Another potential benefit of home refinancing in Albany, NY is the option to take equity from your home loan to help pay for other expenses. The refinancing specialists at Artisan can help you discuss options that may meet your refinancing needs. Speak with the loan consultants today and learn about financing options you may qualify for to help you refinance your mortgage. We are committed to helping you find the right loan. Artisan offers low rates on all of their home financing programs. This section will list the names of your creditors and account numbers, which may be scrambled for security purposes. We can make your transition to being homeowner easy, whether you are interested in learning more about low mortgage rates or you need help choosing the mortgage program that is best for you. Call today for current home loan rates and program information - 800-499-0141. Working with top lenders in area Artisan Mortgage Company offers affordable VA, USDA, FHA, 203k home improvement loans and refinancing options in Albany, NY and surrounding areas of Menands, Voorheesville, Cohoes, Ravena, Watervliet, Colonie, Green Island and Westmere.